Most people know the fundamental rules of being around a horse, like don’t walk behind a horse, try not to make sudden movements around a new horse, and feed a horse treats with your palm and fingers stretched out flat. However, when it comes to feeding your horse on a daily basis, there is a lot that goes into what, when, and how you should feed your horse. At Chaparral Veterinary Medical Center, our experienced equine vets can help you come up with a good diet for your horse, based on his or her unique physical health. To help you get started, we’ve compiled some beginner rules for developing healthy feeding habits for your horse. Depending on your horse’s roles and exercise levels, the majority of pleasure and trail horses don’t need grain. 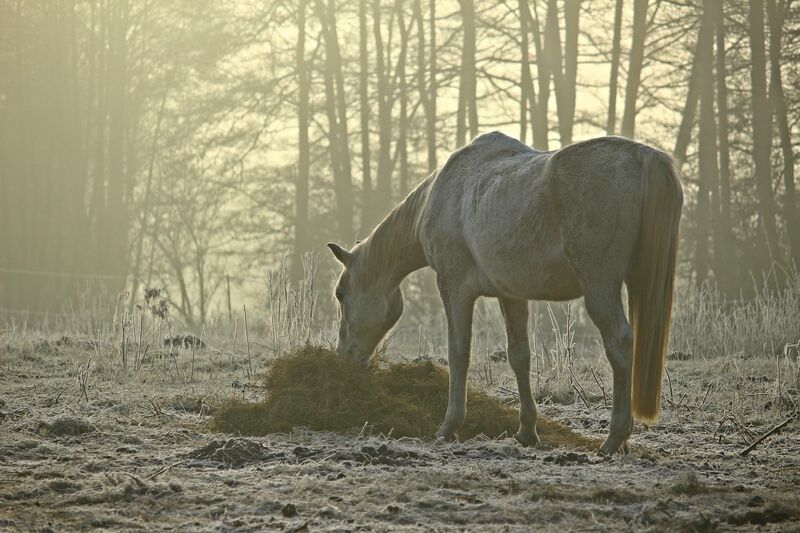 Most horses require a high-quality hay or pasture to snack on. When hay isn’t enough caloric intake for your horse, grain can be added to its food. However, the majority of his or her calories should always come from roughage. For those of you who are entirely new to the horse world, roughage is a mixture of fibrous indigestible vegetables that help horses keep a healthy digestive tract. Horses are grazers, meaning they have evolved to eat roughage, and their digestive system is specifically designed to extract nutrition from grassy stalks. In fact, your horse should eat about 2% of its body weight in roughage a day. Horses that spend most of their time in stalls need to have access to hay most of the day, so they can eat periodically, as if they were grazing a field. This way, roughage is constantly moving through your horse’s system. If it has been determined that your horse needs grain, it is better to feed it grain frequently throughout the day in small portions. You might be tempted to feed your horse twice a day in large portions, since this is the convenient feeding pattern. If you decide to give your horse large quantities of grain, you should also try to break it up amongst an additional lunchtime meal. However, frequently feeding your horse small portions is the most natural eating routine, allowing your horse to digest its food more effectively. During droughts and wintertime, you can supplement pasture with hay. When the pasture is healthy and abundant, you can cut back the amount of hay your horse needs. When adding grain to your horse’s diet, start with small amounts, then adjust to find the right ratio of hay, grain, and pasture for your horse’s physical needs. Have you found yourself needing to change your horse’s feed type, ration, or feed schedule? Make sure you make any changes to your horse’s feed gradually. Sudden changes in the amount or type of food you feed your horse can lead to colic or founder. If you’re altering the amount of feed for your horse, try to make small increases or decreases per meal for a period of several weeks, until the new method is achieved. A good rule of thumb for changing feed type is to replace about 25% of the current feed with the new feed every couple of days, so that after six days your horse is entirely eating the new food. Don’t try and eyeball your horse’s feed. For every meal, you should accurately measure your horse’s feed on a postal or kitchen scale or by using the scale at the feed store. Once you find out the appropriate weight of feed, you can measure the feeding porting with a coffee can, scoop, or whatever you need to use to remain consistent. Most average 1,000 pound horses eat about 15-20 pounds of hay per day. You will most likely purchase your hay in flakes. It’s important to note that the amount of hay in a flake can vary by the kind of hay and size of the flake. If you’re unsure of the weight of the bales of hay, you should weigh the hay to determine the amount your horse needs. If you can, you should wait about an hour before or after exercising your horse to feed them. If you’ve taken your horse for a more intense exercise, try and wait about 3 hours. When your horse’s digestive system is full, their lungs have less room to pump air through its system, making it much more difficult for them to exercise effectively. Furthermore, during exercise, blood flow is moved from the digestive tract, slowing gut movement and putting your horse at risk of becoming colic. Make sure your horse is entirely cooled down after exercise, before you feed it. When your horse is entirely cooled down, their breathing and heart rate will be back to normal, and their skin won’t feel hot or sweaty. Like most animals, horses thrive on consistency. Horse’s require consistent feeding schedules, especially horses that are susceptible to colic. If you notice your horse suffering from abdominal pain after a change in its eating habits, and you should schedule a wellness exam with your horse’s vet, because it could have colic. Want to learn more about colic and healthy feeding routines for horses? Call Chaparral Veterinary Medical Center today at 480-595-8600 to schedule a wellness exam with one of our compassionate and experienced equine vets.